WARNING: THIS IS NOT SATIRE. It is just silly. But 300 protestors? Come-on! A massive 300 protesters turned out in NZ's largest city to protest the imminent sale of the nation's Bassets. Basset hound owners are up in arms over plans to sell 49% of the bassets under National Party policy. Does this mean nearly half the bassets will be sold, or just the ears of each basset, whch represents half the size of the basset? "Bassets are something owned by all New Zealanders" said Prime Minister John Key, so this move just opens up the opportunity for mums and dads and kid investors to have a truly great pet without having to actually pay for its upkeep. For those unable to experience the thrill of taking a basset for walkies, we will keep all the little plastic bags of poo and declare them as dividends." The Labour and Greens have suggested that a new government department would be created to allocate dog walking privileges fairly to the market by regulating which Bassets would be up for walkies at any given time. "This ensures private ownership remains vested in the original owner, but allows for others to experience the thrill of walkies when the dog leaves the property." explained Russel Norman. Gareth Morgan said mining our thriving feline industry would be a better way to go, and suggested cats be prioritized for a float. Preferably somewhere far out at sea, in a boat with a slow leak. The protest of 300 Basset owners has sent a clear message to the government to stop hounding them. regards, N.Z. Union O f Basset Hounds, Woof! Can Gareth Morgan give me a dividend. For Shooting Mynah Birds with my air rifle? Mynah Birds destroy far more chicks and eggs of nesting birds than any cat ever does. Besides they fly right up into the tree canopy and raid nests. Why do you think you see all those newly hatched chicks and unhatched eggs splattered all over the sidewalk and roadway during Spring nesting time. It's Mynah birds dropping them from a height as they've flown overhead. Marian, Mynah birds are reputed to be able to mimic other sounds perfectly. As long as you train them to "meow" just before shooting them, I'm fairly certain that will be all the criteria Gareth needs to pay a bounty. What a cat-astrophe of cat-aclismic proportions!!! What with Marian and your good self doing your bit to decimate the bird population ( with or without them having learnt the art of the "meow" ) and Mr Morgan doing his bit to eradi-cat-e most of the cats in town ... what will there be left for us members of the Bassett Hound Union and all other canines,have left to chase and attempt to cat-ch. We would appreciate any helpful suggestions! 1. Easy As: Let them sniff anything worn by fools, and within half a day they should have rounded up Gareth Morgan. 2. Fun: Let's not pussyfoot around. I have just one word for you - rabbits. Thank you again for the suggestion but we find that we are the wrong cat-egory of canine for this as our legs are too vertically challenged! "I have just one word for you - rabbits." The Basset being an intelligent dog, would instinctively know to give the breed of Rabbit known as "Crusader" a very wide berth. 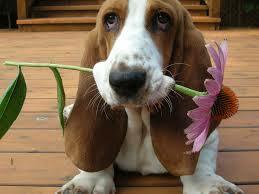 That's a relief--I like Basset hounds.